It all still seems like a dream. 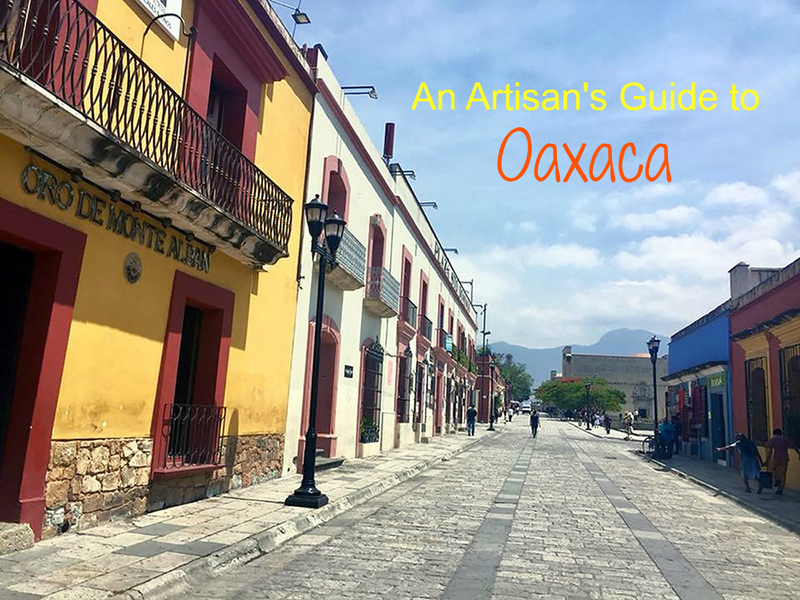 Spending ten days in the cultural wonderland of Oaxaca was like going down an artisan rabbit hole. It all began when a friend notified me that there was an opening in Tracy Verdugo's Paint Mojo Art Retreat in Oaxaca. This was a bit of a miracle since her retreats sell out in 24 hours. I've taken two workshops with Tracy in Dallas, so I knew in a heartbeat that somehow, someway, I must go. As it turned out, myself and three dear friends ended up going on this remarkable journey together. In case this is the first time you’ve ever heard of Oaxaca, you might be wondering how in the heck do you pronounce it. Let me help you out: WAH-ha-ka. My group of friends from Texas plus two new friends. We spent our days painting interspersed with meanderings through the cobblestone streets filled with colorful Spanish Colonial architecture. Dining at exquisite rooftop restaurants and exploring the artisan markets soon became second nature. Taking a breather from one’s familiar environment and daily routine is one of the gifts of attending an art retreat, especially in a foreign country. Absorbing the sights, sensations, flora, colors, art, and handicrafts of Oaxaca spilled into our artwork. Tracy offers the perfect balance of allowing artistic freedom within her skillful guidance. All types of paintings emerged over the next few days from women with baskets on their heads to donkeys to expressive mark making to mermaids. Oaxaca is known for their meticulously hand-painted wooden figures known as the alebrijes. One of our excursions was to San Martin Tilcajete where the alebrijes are made. It was fascinating to learn that the alebrijes represent one’s animal spirit guardian based on one’s birthday. I found out mine was a monkey. From natural dyes, to wood carving to painting by hand, it was fascinating to see the whole process. A jaguar alebrijes found its way into one of my paintings. 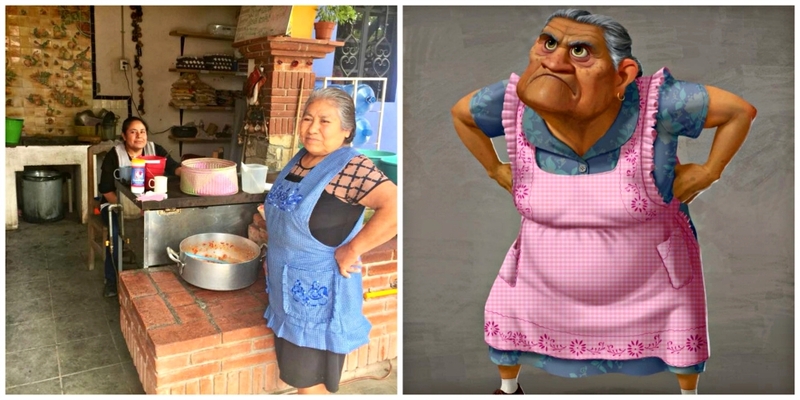 After I returned home, I found out that the Abuelita character from the movie “Coco” was inspired by the Aunt of one of the owners of San Martin Tilcajete. I actually saw her in person and took a photo of her. Oaxaca is a paradise for weavers and textile lovers. Even though I’m not a weaver, I was captivated by to learn about this ancient craft. Artisan villages are located close to Oaxaca City and make a splendid day trip. Casa El Encanto, Teotitlan del Valle is known for its textiles, especially rugs, which are woven on hand-operated looms, from wool obtained from local sheep. These textile artisans work to preserve the use of plant and insect dyes. 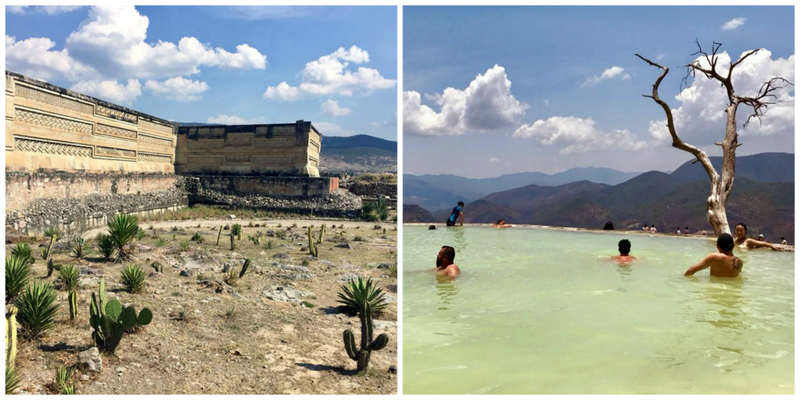 A smaller group of us hired a private driver to take us to the UNESCO archaeological ruins in Mitla, then to the natural infinity pools that fall off a cliff at Hierve El Agua. We also stopped to see the widest tree in the world, El Arbol del Tule inside the gated churchyard in the picturesque town of Santa Maria del Tule. Back in Oaxaca City, the tours at The Ethnobotanical Garden focus on the cultural history of the region and are offered at certain times on certain days. I highly recommend going. Casa Oaxaca has a fabulous view of Santo Domingo. Tres Bistro has a terrific view of the Zocalo. Vieja Lira is a chamring Italian restaurant. I ate their twice. Los Danzantes doesn’t have a rooftop, but it has a lovely open courtyard setting. Los Pilares Hotel is fantastic. I loved this place. A charming married couple own this beautiful place and you can tell they put their heart and soul into making your stay there a wonderful experience. I especially loved the rooftop restaurant and pool area. This Oaxaca experience has deeply influenced me. 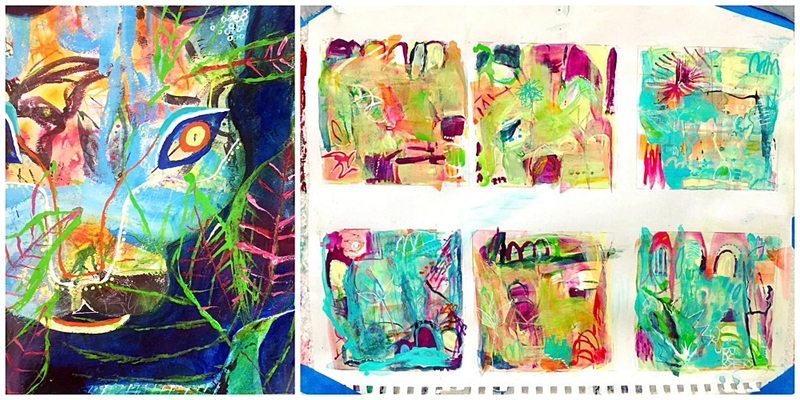 The images that I saw there are spontaneously popping up in my artwork. I’ve even chosen to make my experience of Oaxaca the inspiration for my next art show scheduled for September 21-23 at The Cove in McKinney, Texas. Hope to see you there! Photo Credits: Silky Hart, Anya Oram and Tracy Verdugo. Save this post to Pinterest for future reference.